Over the past few days the biggest (to date) Hearthstone tournament at the Dreamhack festival in Sweden. With a $10000 prize going to the winner, it was a pretty big deal in the community, and it was all the reddit and other community sites could talk about for the days preceding and during the tournament. The final boiled down to two very good players: the popular Korean streamer Amaz and the less well known, but no less skilled, RDU. At the bottom left is RDU, and at the top is Amaz. The message reads (roughly): "he still has a bow and a hunter's mark"
It's worth putting this message into context for those who don't know Hearthstone, because that small amount of information is very important for how the match progresses. 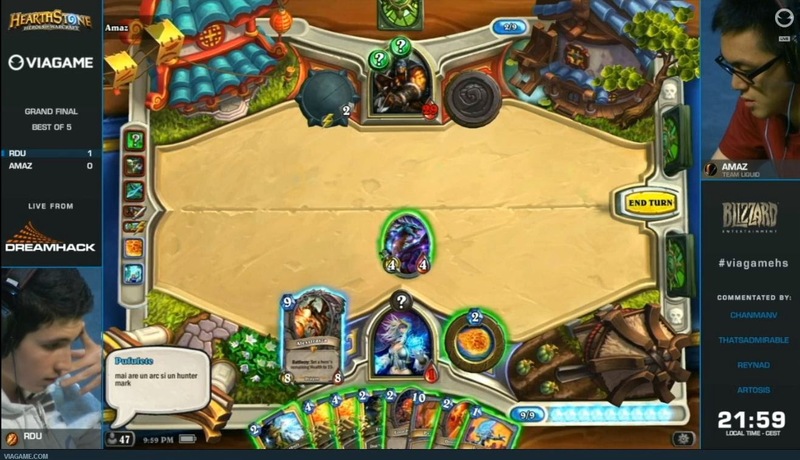 At the bottom of the screen is RDU, his hand of cards is laid out in front of him, in front of his hand is his Mage hero (with his HP indicated by the red "1"), in front of that is the board (with an Azure Drake in play) and then on the other side is Amaz's Hunter hero (29 health) with 2 secrets in play (the green "? "s) and a single card in his hand. RDU knows that Amaz has very few options, with only a single card in hand. But Amaz has a substantial health lead on RDU - being almost at full health with 29, with RDU on the verge of death with just 1. RDU himself has a single secret in play - an "Ice Block" which, when he takes fatal damage, will protect him from dying till the end of that turn. 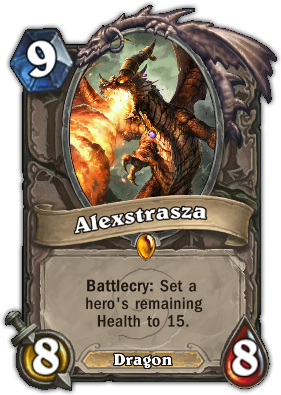 He is holding an Alexstrasza card: a big minion card which can bring a hero to 15 health immediately - he can choose to use it on himself (to bring himself up from 1 to 15 health) or use it on Amaz (to bring him down from 29 to 15 health). 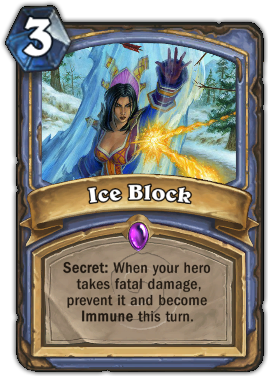 This card is vital for RDUs deck: the aim being to use Alexstrasza on the enemy before the turn you intend to kill them, then pass the turn to them knowing that you cannot die during his turn due to the Ice Block protecting you. You then burst them down with spells the next turn for the win. 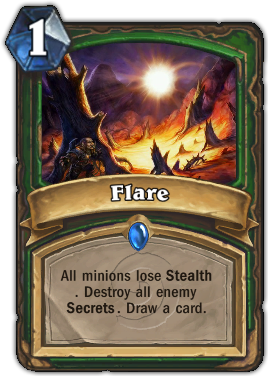 BUT the Hunter, in his arsenal somewhere, has a card called "Flare" this single card is unique in Hearthstone in that it removes secrets from the board. If Amaz has this card in hand then the win is his - he waits for RDU to play his Alexstrasza and pass the turn to him - then he plays his Flare, removing the Ice Block and he swings in for the lethal damage and the $10k prize. Its important to emphasise that this play would not be uncommon and, indeed, we'd already seen it earlier in the tournament - in an earlier game Reynad held a single Flare in hand the entire game (holding off on numerous chances to play it earlier) in order to play it after his opponent played Alexstrasza and to swing in for lethal damage. The safe play then, for RDU, is to use Alexstrasza on himself - bringing himself up from 1 to 15 health and allowing him to attempt to win the game in the long-run. But with this new piece of information - Amaz only has a "Hunter's Mark" card as the single card in his hand - RDU doesn't need to worry about Flare. Consequently, he is free to reduce Amaz to 15 health and pass the turn - safe in the knowledge that he can do 15 damage to him when the turn is passed back to him (double Fireball (6x2) and a single Ice Bolt (3)) and there is nothing Amaz can do to stop him (unless the single Flare card in his deck is pulled off the top of the deck that turn - which is unlikely) - and of course that is what happened. Firstly, and perhaps most importantly (because this contradicts message that Artosis and other guys surrounding the event have been saying) regardless of whether RDU arranged the message - there is absolutely no way you can guarantee that the information did not effect the way he played out that turn. Granted, whether Alex'ing himself or Amaz - RDU still had a very good chance of finishing the match off. If he did Alex himself then he'd still be able to deal 24 damage to Amaz next turn through spells and the minions on board (likely taking only a couple of points of damage in response), before doing a possible 10 damage with Pyroblast the next turn. So it was unlikely to alter the outcome of the match - but you simply cannot guarantee it, you cannot account for the longer turn leading to possible miss-clicks (particularly because this was one of the, if not the, first pro gaming tourney to be played on a tablet), you cannot account for Amaz potentially getting a really lucky draw and being able to cycle his cards till he gets his Flare and enough damage. Stranger things have happened, and whilst it is very unlikely, I don't think you can argue with absolute certainty that it wouldn't have happened this time. So making the argument that "it doesn't matter" is incredibly short sighted, it absolutely does matter if a player is receiving outside help which influences their decision making process, and how it came to happen needs to be investigated. I'm not saying RDU in any way organised for this message to be sent to him: it would be pretty stupid of him to tell someone to just obviously blurt out the contents of his opponent's hand during the turn. It is being filmed, after all, with thousands of people watching in the arena and countless others watching the stream, it would be utterly ridiculous for him to even consider attempting to cheat in this way. I believe it is more likely that he has some pretty slow people on his friends list who don't know how to act appropriately. So my second point is: unlike Trump, I believe that RDU is absolutely responsible for the kind of people he adds to his friends list. He's not responsible for their actions, but he is absolutely responsible for adding them in the first place, and if they are going to act like complete idiots during one of the most important moments of this guy's early gaming career then perhaps he should reconsider their place on that list. Finally, the community's response has ranged from dismissing the incident as inconsequential to the outcome of the match, therefore not worth debating. To calling for disqualification for RDU and the awarding of the prize money to Amaz (who, incidentally, still received a $5k prize for second place). Disqualification or even a replay seems unlikely now - the tournament is over and even Amaz has asked people to drop this particular path, which I think is wise. For Blizzard - we need an observer mode to allow easier access to both sides of table. Hearthstone, in the short few months it has been running, has evolved into one of the biggest pro-gaming scenes out there. Eclipsing Magic the Gathering as an eSport at least. An observer mode is absolutely vital, not only for the big tournaments such as Dreamhack and the upcoming Blizzcon Tourneys, but also for smaller scale community driven tourneys such as Deckwars and iHearthU's King of the Hill. We also need a "tournament mode" for the friends list, which will block all incoming and outgoing messages whilst it is active. I think that's a no-brainer. For players: you are absolutely responsible for who you add to your friends list. Particularly at the moment when there is no way to block messages if you're in a competitive setting. It shows a lack of maturity and forethought to add random people to your friends list who might act in such a way as to compromise your reputation - as has happened at Dreamhack for RDU. I honestly don't think the community will let RDU forget this particular event, even if this all blows over he will always be remembered for this particular incident, simply because it was so public, there was such a large amount of money on the line and his opponent Amaz is such a popular player in the community. His lack of forethought will have long-standing repercussions for the perception of him in the community for a long time to come. EDIT 2 (the Salt Continues): So the third placed competitor, a popular streamer called Reynad, who was beaten in the semi-finals by RDU, has straight come out and accused RDU of cheating (in both his semi-final game and the final itself) and agreed to put his own money on the line in a one-off match to win the title from RDU. First off, he needs to grow up. He can't throw his money around and essentially lay down a gauntlet that a 17-year-old RDU can't really afford to run. That leaves Reynad in a pretty comfortable position to say "well he won't play me because he knows he will lose" - that is the arguement of a bully and regardless of RDU's actions during Dreamhack, Reynad should be pretty ashamed of himself for that. On the flip side, this is further evidence against the Artosis arguement of "all the pros agreed to drop it". And, unlike some of the people Artosis is likely to referring to - Reynad is one of the players directly effected by RDU's supposed cheating. I don't think, at this point, it can be just "dropped" - and the organisers of Dreamhack really really need to take a look at the games and their set up and consider a course of action. If, ultimately, this comes back to "drop it" then so be it, but Reynad needs to let other people take care of this rather than starting some kind of one-man schoolyard bullying campaign against RDU.